Construction on the second Penang link is surging ahead of schedule with 84.35% of the massive project completed. Jambatan Kedua Sdn Bhd construction director Hamizol Ngah (pic) said as of Sept 20, work was 2.45% ahead of plan. “We are two months ahead of schedule from the September 2013 deadline. 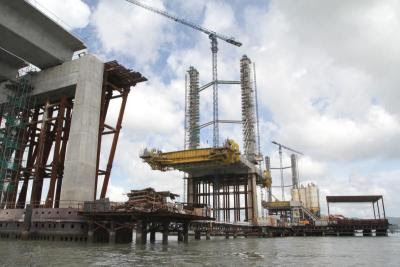 “We aim to have 90% of the bridge completed by end of the year,” he said in a briefing to state officials at the China Harbour Engineering Co Ltd (M) Sdn Bhd (CHEC) office in Batu Maung, Penang. Hamizol said if work continued as planned, the two ends of the bridge would converge at the main navigation span in early April next year. 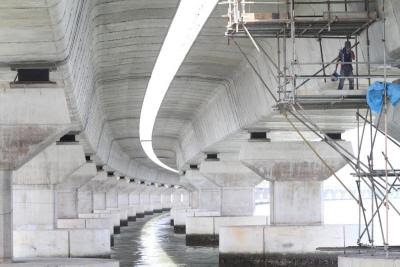 The 24km bridge will then go down in the history books as the longest bridge in South-East Asia. Hamizol added that the second bridge has a lifespan of 120 years and can handle earthquakes up to 7.5 on the Richter scale with its High Damping Rubber Bearing system. 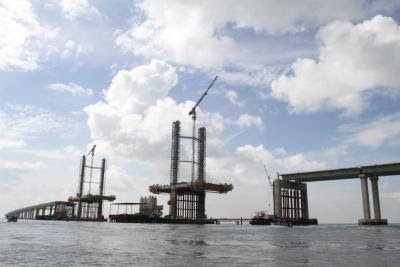 Penang Public Works, Utilities and Transportation Committee chairman Lim Hock Seng, who was present at the briefing, said two traffic dispersal projects on the island end of the bridge were expected to start next year. “The Federal Government has approved RM262mil to upgrade the coastal road (Tun Dr Lim Chong Eu Expressway) from the entrance of the second bridge to the Penang Bridge. “Aside from that, RM161mil has also been allocated to upgrade roads leading south to Teluk Kumbar from the Batu Maung interchange,” Hock Seng said. He added that both projects were expected to be completed about a year after the second Penang bridge opens for traffic in September 2013. “We expect about 30% of the first bridge’s traffic (70,000 vehicle per day) to move to the second bridge, so we think traffic will be manageable until the two upgrading projects are completed,” Hock Seng said. On a related matter, Hock Seng said the state had been informed that CHEC, one of the contractors of the second bridge, was not involved in the building of the Harbin Yangmingtan Bridge that collapsed in China on Aug 24.
last weekend seen the 2nd bridge from Penang hill, exactly same as current used bridege just longer only. no special wow from the scene. the train very fast, guess 70-80km/hour, less time to wait eventhough with long Q.
with dolphin moving around, dunno is good or bad? ?